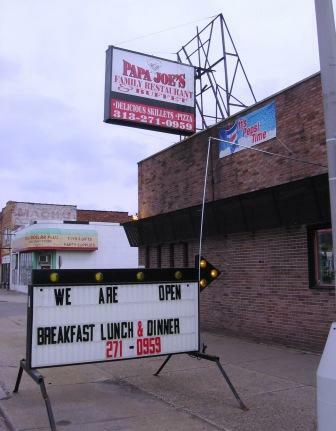 Papa Joe's Family Restaurant & Buffet (19305 W. Warren Ave. - 313-271-0959) opened in Warrendale earlier this month. They serve breakfast, lunch and dinner 7 days a week. I've visited them twice and have been impressed with their food and service. They have an all-you-can-eat buffet for both lunch and dinner that is reasonably priced and looked good. Personally, I preferred their pizzas and calzones. I like the fact that they have a selection of five personal-sized pizzas. The staff at Papa Joe's is also top-notch - friendly and helpful, without being pushy. Good food and service. Warm, inviting down-home atmosphere. Decent prices. You really can't beat that a combination like this. The only thing that I don't really like about them is that they don't have much parking near them (other than what's on the street) and they don't take credit cards. But hey - hit an ATM on the way over and walk a block or two - it's worth it.